Visibility and durability are essential to any Home Improvement Store Uniform Program. First, your customers need to quickly be able to locate your employees when they need them and second, the uniforms need to hold up after continuous wear and tear. 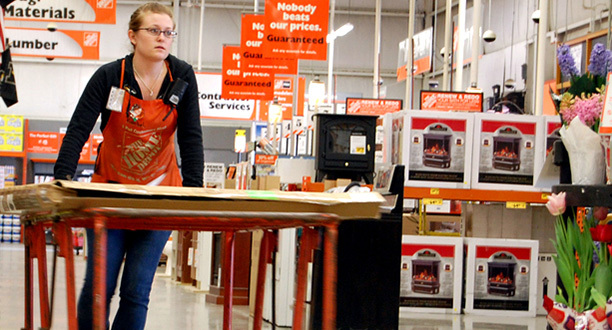 The Home Depot’s signature orange apron immediately calls to mind the company’s concept of offering all your home improvement needs under one roof. The orange apron is the symbol to look for on the sales floor. Every home improvement company needs a symbol to enable their brand to have meaning to their customers. This is where Clipper can help. Your customers need to be able to find your employees quickly and easily when they need assistance. That’s why one of our key design focus areas is visibility. Clipper creates comfortable, yet durable uniforms and custom apparel programs, finding the precise balance between appearance, practicality and cost. We help you bring better service to your customers by making your employees stand out in the crowd. And we save you money in the process.